It is one year since Alan Kurdi drowned in the Mediterranean. Heart-breaking images of the toddler's body lying washed up on the beach spread around the world. It led to powerful calls for European governments to do more to help those fleeing war and oppression in Africa and the Middle East. Yet a year later the plight of refugees trying to enter Europe is still a humanitarian disaster. Around 3,000 have died crossing the Mediterranean so far this year. The Italian coastguard rescued over 1,000 people from the sea in just a single day last month. Desperation is still forcing refugees into the hands of people traffickers. They risk everything to make the dangerous journey. Arrival in Europe is often not the end of their ordeal. They're greeted with high fences, camps with appalling conditions, and the harassment that comes with being used as a political football. As the wave of sympathy died down last year, right-wing politicians cynically reverted to scapegoating migrants. But the problems come from their policies and the capitalist system. 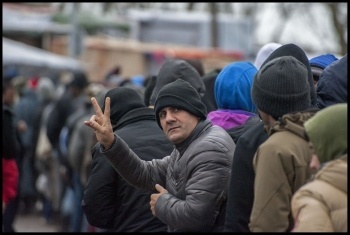 'The Jungle', the infamous refugee camp in Calais, is reportedly home to over 9,000 people and growing daily. Residents live in squalor, reliant on the charity of ordinary people, and under constant threat of eviction by French authorities. Worst of all, the camp is home to over 800 children, the vast majority unaccompanied. They are at severe risk. Police estimate that almost 9,000 refugee children have gone missing in Germany alone. A House of Lords report in July found child refugees were being "systematically let down" by the UK, and by the EU and its member states. However, last month the Home Office won a court case to prevent unaccompanied children from joining families in the UK. Refugees, especially children, must be housed and helped, not vilified. Reverse austerity and invest in homes, jobs and services for all workers - not racist scapegoating while the super-rich rake it in. The Socialist Party fights for a socialist world, free from war, terror and poverty, where people can move around freely, not be forced to flee. Should socialists give electoral support to Labour right? Apple told to pay £11bn: nationalise all the tax dodgers!